OPENED WITH A GLAMOROUS FANFARE IN JULY 2014, FAQRA IS NOW THE SHOWPIECE OF MASSAYA, SITUATED IN FAQRA, KFARDEBIAN AT THE FOOTSTEPS OF THE SKI RESORT OF MZAAR, OUYOUN EL SIMANE. 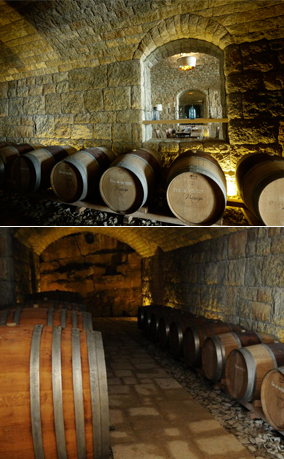 CREATED AT 1,700 METRES, HIGH IN THE MOUNT LEBANON RANGE, THIS IS A STUNNING NEW ENTERPRISE WITH EXTENSIVE CELLARS CARVED INTO THE MOUNTAIN ROCK WHERE THOUSANDS OF BOTTLES OF VINTAGE RED WINES MATURE. 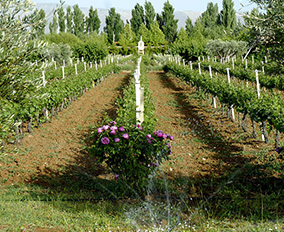 A WINERY PRODUCES THE MASSAYA WHITES FROM GRAPES GROWN AT ALTITUDE AND VISITORS CAN ENJOY A DELICIOUS MENU FROM TWO STYLISH RESTAURANTS - PLUS A SUMMER OUTDOOR BISTRO WITH SPECTACULAR VIEWS TO THE ROMAN TEMPLE AND AS FAR AS BEIRUT AND THE MEDITERRANEAN. Located within the fireside intimacy of the Sunset Bar you will discover one of Massaya Faqra’s two fashionable year-round dining options. The menu here is based on the log burning oven and includes salads, meats, mussels, pizza and cheeses plus a selection of classic desserts. Here, and in all our restaurants, the full selection of Massaya red, white and rosé wines are served. 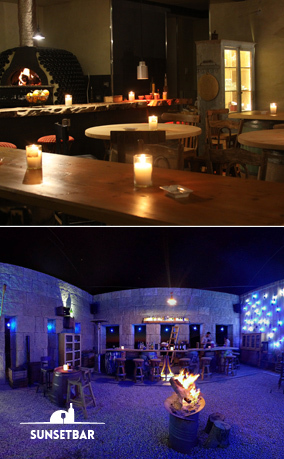 At the centre of the winery is the splendid Fireplace Restaurant. With vaulted and double level ceilings, cozy couches and stave barrel furniture, this is the place for memorable meals with friends and family. 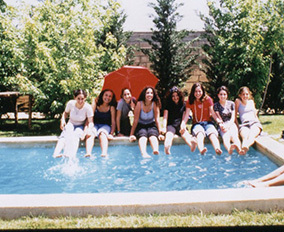 The main menu options are the Campagnard Buffet or individual pots of stews, soups, salads and cheeses à la carte. Top chefs will be helping us develop an ambitious menu. Through Lebanon's long summer there's nothing more natural than eating al fresco in the warm mountain air. As part of the excavations at Faqra we have incorporated a pretty pond below the terraced dining area. The scenery is stunning with views across the gardens, the vines, the Roman temple and all the way to the Mediterranean Sea and Beirut. Several stations will prepare the Buffet and dishes close to the tables. For more inquiries +961 70 122 414. Five magnificent vaulted cellars carefully hollowed out of the mountain rock are the resting places for upwards of 13,000 bottles of vintage red wine. We let nature take care of the ageing process as the wines mature in the natural damp air with temperatures at a steady cool. Alongside the racks are the large oak barrels, foudre and demi-muids, where the white wines are fermenting. We invite visitors to experience the beauty and atmosphere of the cellars or to view them through the glass wall of the Fireplace Restaurant. Massaya Faqra has created two hillside options for outdoor events with everything laid on for personal celebrations, entertaining or business events. The Hill Top with spectacular views around 360 degrees that include the natural bridge, the Chabrouh dam, the Roman temple and the distant Beirut can accommodate 400 guests. The Pond area has space for 600 guests. We provide the venue while the catering and other services are brought in from external suppliers. A member of our team is available to coordinate large events to make sure the Massaya experience will exceed your expectations. For more inquiries please contact +961 3 735 795. During the building work we took the imaginative decision to create a brand new amphitheatre overlooking the pond. This special feature is an ideal setting for music and drama performances.